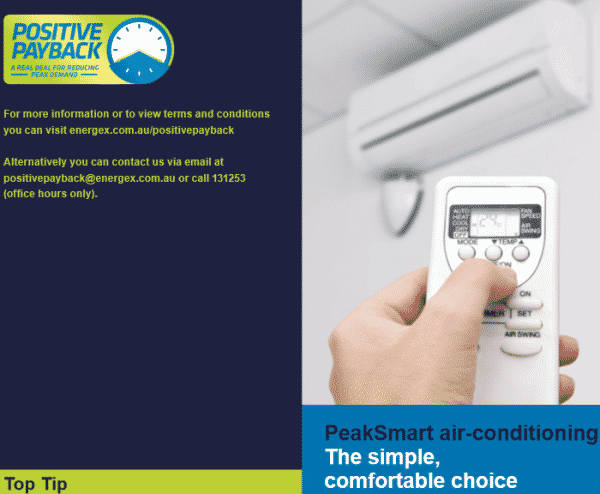 Energex is rewarding air conditioning customers in Queensland with their positive payback scheme when you purchase a new air conditioning unit with PeakSmart technology. Here at Crown Power our split system air conditioning and ducted systems are able to take advantage of this new technology and you by installing the technology on your system you can receive a financial reward paid directly into your bank account. We explain how the scheme works and answer some frequently asked questions in this blog post. How does the technology work and what are the benefits? PeakSmart technology is used to address peak demand on energy networks across the state. Since most people use their air conditioning systems between 4-8pm during summer this creates a peak demand and the network can struggle to cope with this demand. By installing a receiver on the unit which is operated wirelessly, usage is capped during periods of peak demand to ease pressure. This will also help save operating costs on your AC system. When a period of peak demand is reached, the receiver is remotely told to change the output of the system and requires no action on behalf on the owner. It is designed to set and forget. Will it affect my comfort level? No. cooling capacity is only adjusted down to 60 per cent for a certain amount of time. Usage of each individual system is not significantly capped that users will notice much of a difference on an individual level. The occasions where usage is capped each year are also rare. Setting your air conditioning system to a comfortable 24 degrees will also help save money on operating costs, reduce pressure and reduce pressure on energy networks during periods of peak demand. How much is the reward for installing PeakSmart technology? 4kw-10kw systems are eligible to receive a 250 dollar reward. 10kw and above systems are eligible for a 500 dollar reward. Each household can claim up to three rewards for separate systems. For more information on how to apply for a receiver and apply to receive a reward see the Energex Positive Payback page or contact the team at Crown Power about a new energy efficient air conditioning model capable to benefit from PeakSmart technology.